Wanting more than a logo and tagline, Cabarrus County sought an authentic, research-based brand that reflected the community as it is today. The research overwhelmingly showed that the community united around four values—family, faith, collaboration and tradition. Starting with Living the Brand Workshops, the County began a year-long project to develop the brand storyline in conjunction with the County’s 225th anniversary. The County will use the brand to project its strategic vision, develop recognition among residents, attract new residents and businesses, engage employees, and aid with the recruitment of a talented and diverse workforce. The County previously used its seal for graphic representation and will continue to do so in an official capacity. In Fiscal Year 2005, the County developed the “Cabarrus County The Center of American Motorsports” logo as an economic development tool. 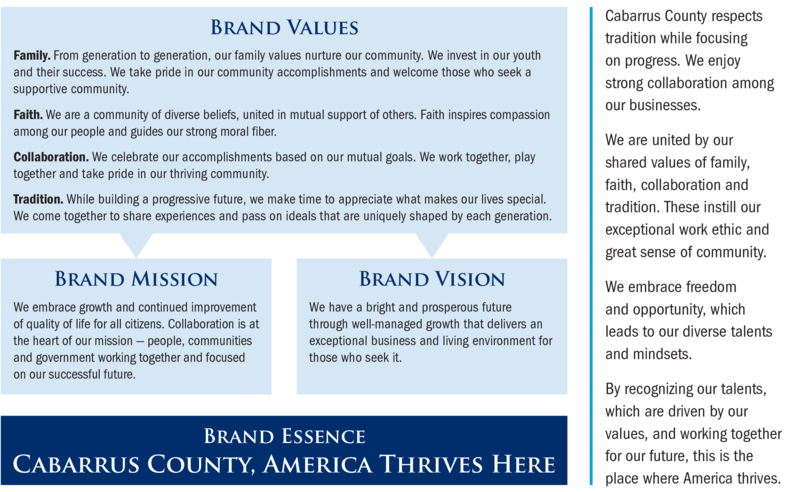 The County hired Avant Marketing to administer the research, brand development and brand implementation. Walker Marketing developed the logo and graphic design of materials that will make the brand recognizable by the community. Alongside the branding process, the County’s Information Technology Services (ITS) department is in the process of redesigning the County’s website. The new website, which will launch in test mode on October 16, will reflect the brand and streamline steps between entering the site and getting answers or conducting business. 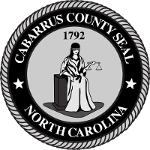 Cabarrus County logo and tagline are protected by copyright and may not be used without permission. For more information, email outreach@cabarruscounty.us. Decided to award the research, brand development and launch. Will continue our search for a firm with strong creative portfolio and record of accomplishment. Community survey indicates that in the first six months since the brand rollout, 14% of our population are familiar with the brand, America Thrives Here, and 24% are familiar or very familiar with the brand logo. ​For more information on the branding process or to submit your own question for the FAQ, please email outreach@cabarruscounty.us or call 704-920-2336.